The inclusion or exclusion of debts in a divorce proceeding depends upon certain factors. • When a debt results from the provision of necessities, it is included. • If a debt is incurred from the acquisition of luxury items before the couple has separated, it is included. • If the debts results from luxury purchases after the couple has separated, it is not included. 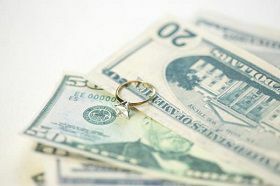 Your attorney views the above rules as economic in nature rather than legal, due to the single economic unit that was formed when the couple married. The reasoning for this stems from the manner in which the economic status of a couple is altered when they divorce. When married couples decide upon financial issues, the two spouses decide as one, functioning as a single economic entity. Should this decision result in monies owed, the debt forms part of the marital estate because the couple made the decision together. Given the above premise, it could follow that should either spouse incur a debt after they have separated, that debt would not form part of the estate. When couples separate, a considerable difference in economic resources can form between the one and the other. The person who has the fewer financial resources may be forced, in order to survive, to go into debt. The disparity in resources is more a function of an economic imbalance that exists between husband and wife than an absence of sufficient resources to provide for both. That being the case, both parties should take responsibility for debts that are incurred in order to sustain the one or the other after the couple has separated.